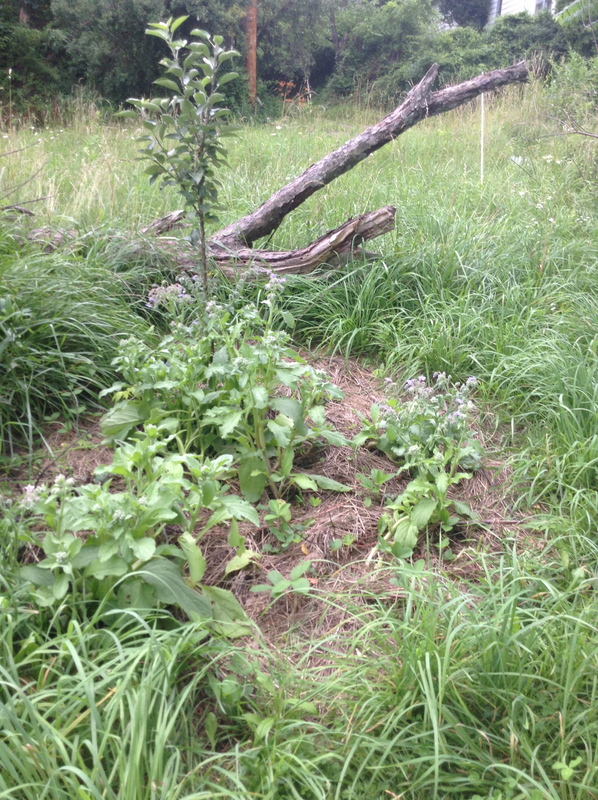 About a month ago I posted about the technique I was using in my food forest to get rid of the grass and make planting beds for more desirable plants. 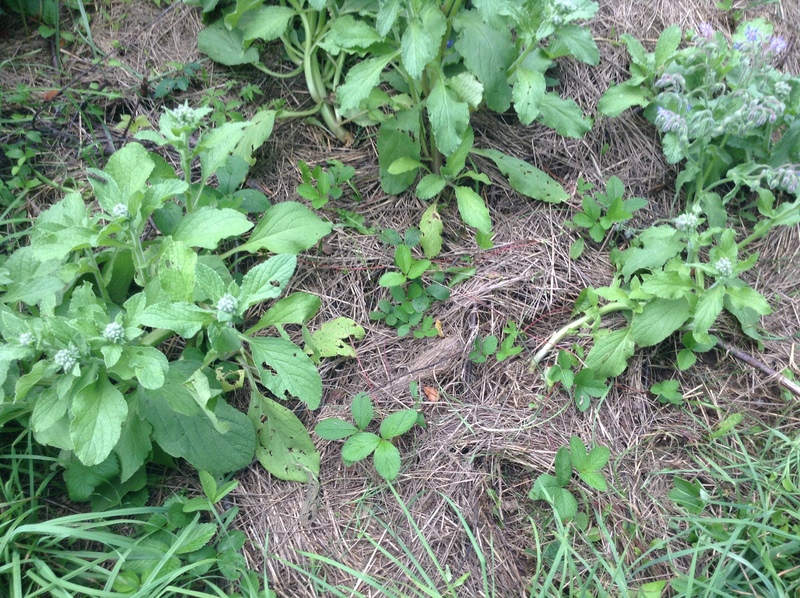 Here is the patch I had planted with strawberries and borage as shown in the Group and Conquer! post. Now here is the same patch about a month later. All the plants in this picture were planted in the earlier picture, if you were wondering. That just tells you how deep the mulch was! I did have a few grasses try to grow through the mulch, but I simple ripped the blades off that were sticking out, and fluffed the mulch back over that spot. This really has worked to make a happy strawberry patch — the strawberries are already putting out runners! Let me know if you have ever tried this technique, or know anyone who has. Basically because I cannot abide the idea of exporting nutrients (anything living / recently living) off site and want to use them in as efficient a way as possible I have used all the grass cuttings (most of the garden is currently lawn) and put them on the polyculture patch along with almost all of the hedge trimmings. 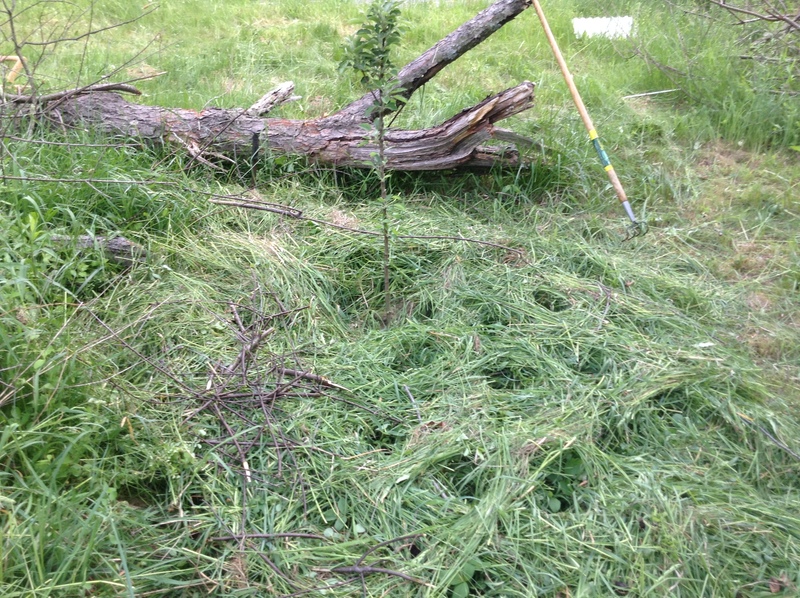 Some of the lawn cuttings have gone on my “hedgetable patch” as well but nothing has left the site. I did not necessarily think it would work when I tried it but just did it anyway to see what happened. By any normal standards of gardening it was not sensible as people say that grass will go all slimy and nasty if left to rot. In fact what has happened is that the plants in the polyculture have grown beyond all possible expectation. Once they got going there was no stopping them! I have not yet harvested the root crops that I am hoping are lurking below ground and when I have I will write a post about the whole process. I will definitely repeat it next year to create a new patch / patches. I will continue to read through your lovely blog when I get some more free time. Yes, I’m the same way about bringing in or sending out nutrients.I think there are very few instances where sacks of fertilizer and mined nutrients are really necessary. It’s all “locked up,” just waiting to be freed by worms, and other animals, if we just let them do their job as Robert Hart put it. I look forward to reading your post about root harvests from the new polyculture.